I have discreetly updated the Louisiana Purchase Treaty. As some of you may have noticed, earlier versions of blogs sometimes appear on the screen. Or else, a thought comes to one’s mind. Writing allows further understanding of an event. My last posts have not been very entertaining. I have readers who require information. However, my main reason for writing to you is that I may not be able to post articles for two or three days for medical reasons: minor surgery. Or else I may post articles that do not require much research. But I will reading your blogs. 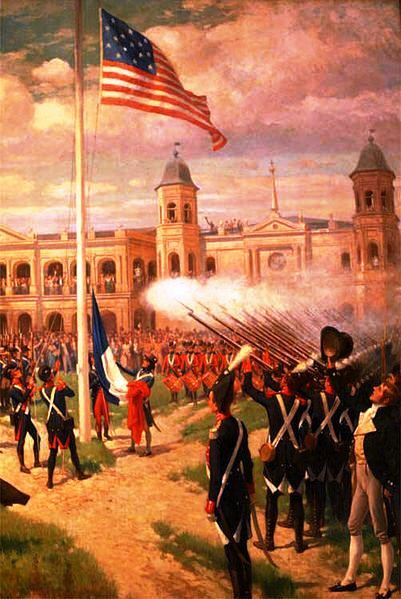 Ceremony at Place d’Armes, New Orleans* marking transfer of Louisiana to the United States, 10 March 1804, as depicted by Thure de Thulstrup. In 1762, the French gave the territory to Spain. Napoleon took it back in 1800, hoping to build an Empire in North America. 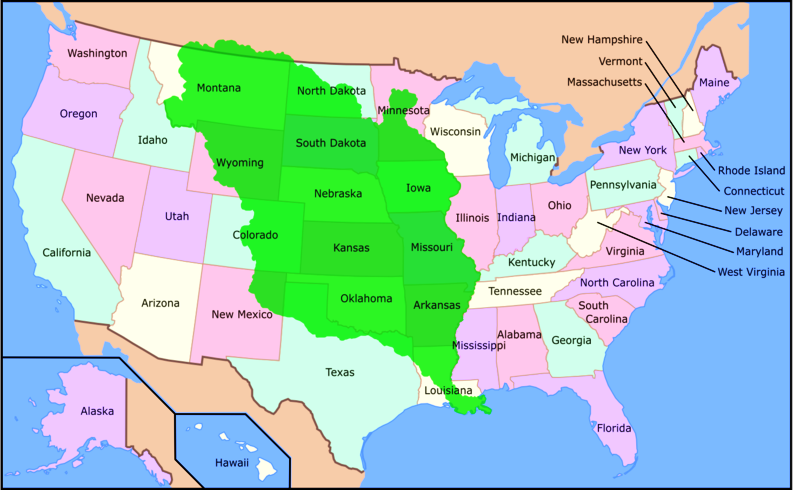 Three years later, in 1803, Napoléon sold Louisiana to the United States. 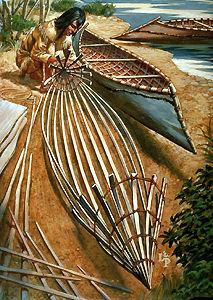 In 1673, explorers Louis Jolliet and Jacques Marquette traveled down the Mississippi to within 435 miles (700 kilometers) of the Gulf of Mexico and claimed both sides of the River (all the way to the Rocky Mountains) for France. The territory was given to Spain in 1762, but reclaimed by Napoléon in 1800. We have lived long, but this is the noblest work of our whole lives… From this day the United States take their place among the powers of the first rank. Upon learning that Napoléon sold Louisiana, one is baffled. Moreover, given that Napoléon sold it for 15 million dollars, one can easily jump to the conclusion that Napoléon knew nothing about real estate and made terrible mistakes on both sides of the Atlantic. Yet, it may be that Bonaparte did what he had to do. 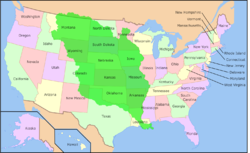 When the US approached Napoléon, which it did, all it was asking for was a right of way or a strip of land to the south of Louisiana which would have linked the eastern part of the current United States to its western part. The US was somewhat landlocked. However, Napoléon reflected that the United States could buy not only the very south of Louisiana, but all of it, for what we would call “peanuts,” i.e. very little money. In fact, one wonders whether or not Napoléon had discussed the matter with Talleyrand. Charles Maurice de Talleyrand-Périgord, prince de Bénévent, then prince de Talleyrand (1754–1838), was Napoléon’s éminence grise or right-hand man. Well, Talleyrand actually negotiated the Louisiana Purchase Treaty. It would appear that Napoléon needed to purchase ships so he could conquer the world, with the exception of what would become the United States of America. Fifteen million dollars could buy him a fleet. It also appears France had debts to repay. However, we cannot exclude early warning signs of the development of the rather pompous “Manifest Destiny.” In the not-so-distant future, the territory France sold would probably have been conquered by an expansionist United States, in which case France would have lost Louisiana. It at least earned itself a consolation prize. For instance, on December 2, 1823, the United States introduced a policy known as the Monroe Doctrine, after President James Monroe (April 28, 1758 – July 4, 1831). The Monroe Doctrine was a document authored by Secretary of State John Quincy Adams (July 11, 1767 – February 23, 1848) who succeeded James Monroe as President of the United States (POTUS) between 1825 and 1829. The document stated that European countries, or any other country for that matter, could no longer colonize South or North America. Could he have been so bold had the US been considerably smaller? I doubt it. 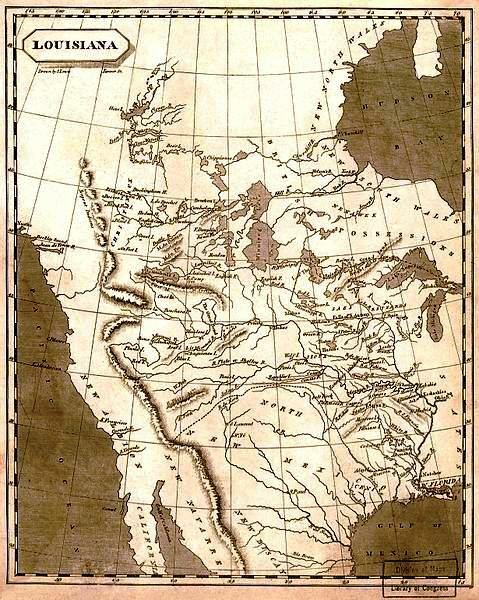 Therefore, the Louisiana Purchase Treaty, signed on April 30, 1803, may have led, in part, to a somewhat inflated view on the part of the United States concerning its place among nations. When Livingstone stated that “[f]rom this day the United States take their place among the powers of the first rank,” he was giving the US a glorious future. I do not know whether or not this notion has been expressed in textbooks on the history of the United States, but by selling Louisiana, Napoléon played a major role in empowering the United States of America. 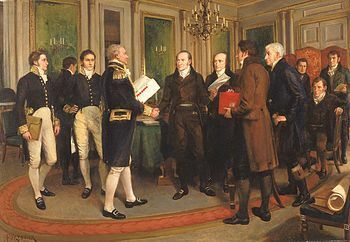 In 1763, under the of Treaty of Paris, France chose to keep Guadeloupe and ceded Canada, Acadie and territory east of the Mississippi to the British. Later, in 1803, under the presidency of Thomas Jefferson, at fifteen million dollars, France chose to “give,” or nearly so, Louisiana to the United States. 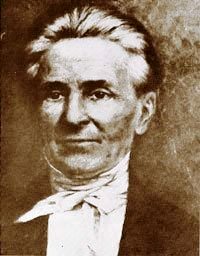 Père Marquette and Louis Jolliet would have felt betrayed by the Treaty of Paris (1763)and the Louisiana Purchase Treaty. Napoléon Bonaparte removed from North America all that was left of France’s presence on the North-American continent, a continent French explorers, missionaries and Canadiens voyageurs had opened in its near totality, or almost. Paris at the very end of April is a delightful city. All that was old is new again. But Mr Livingstone, with all due respect, could you really tell your fellow nation crafters that acquiring Louisiana was “the noblest work of [y]our whole lives?” I would agree, however, that April 30, 1803 was a very fine day in the history of the United States of America and that all parties involved had something to gain, except for the people whose motherland ceased to be France, for better of for worse, with the stroke of a pen. Arkansas, Missouri, Iowa, Oklahoma, Kansas, and Nebraska; parts of Minnesota that were west of the Mississippi River; most of North Dakota; most of South Dakota; northeastern New Mexico; northern Texas; the portions of Montana, Wyoming, and Colorado east of the Continental Divide; Louisiana west of the Mississippi River, including the city of New Orleans; and small portions of land that would eventually become part of the Canadian provinces of Alberta and Saskatchewan.